It’s a game day extra here at spalanz.com! 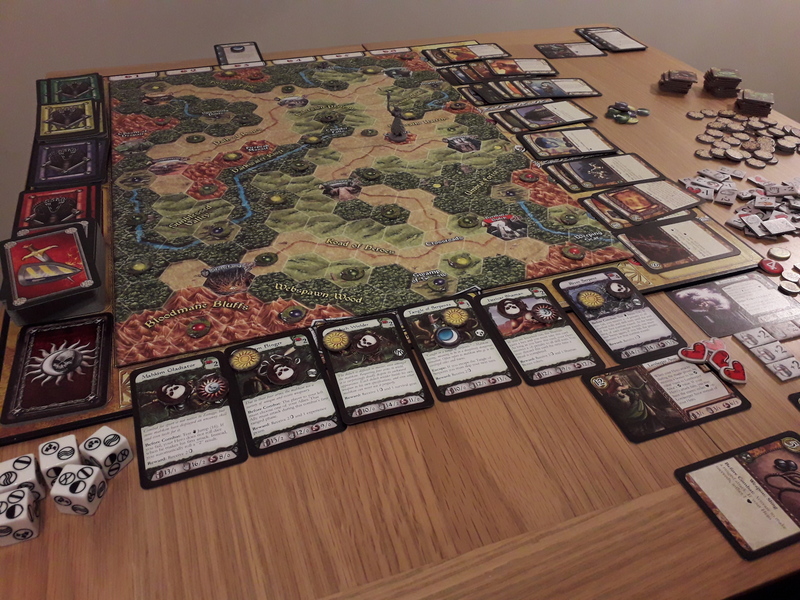 As it’s Fantasy Week here, in celebration of the blog’s third birthday on Friday, I wanted to talk a bit about the upcoming Unbreakable Bonds expansion for Runebound third edition, which provides a co-op/solo alternative to the game. 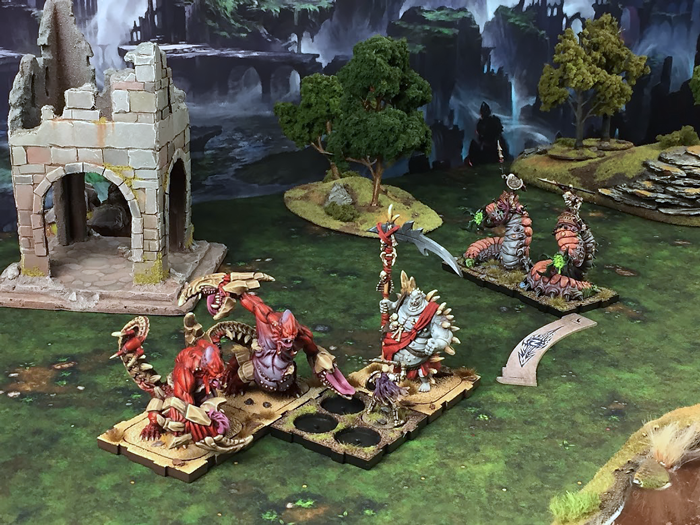 There hasn’t been a great deal of news for the new edition of Runebound for quite some time, which has had many folks fearing the sky would soon be falling on the game. But feat not! 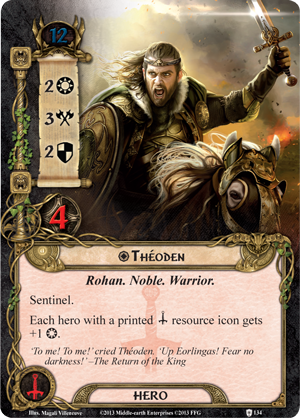 This bad boy is coming in the third quarter, with new stuff (including new heroes) to add to the game. 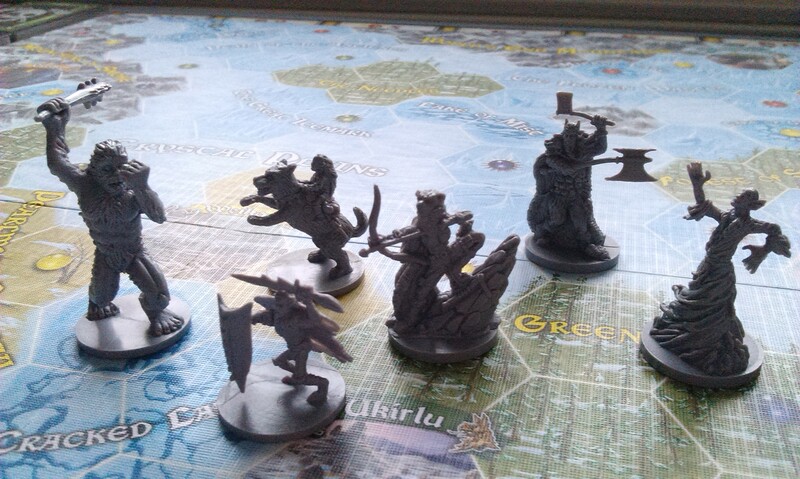 The way that combat is being handled in this expansion has interested me a great deal, as rather than having specific rules to essentially bolt-on a monster AI, there are new “combat boards” for four different monster types, along with the respective combat tokens. 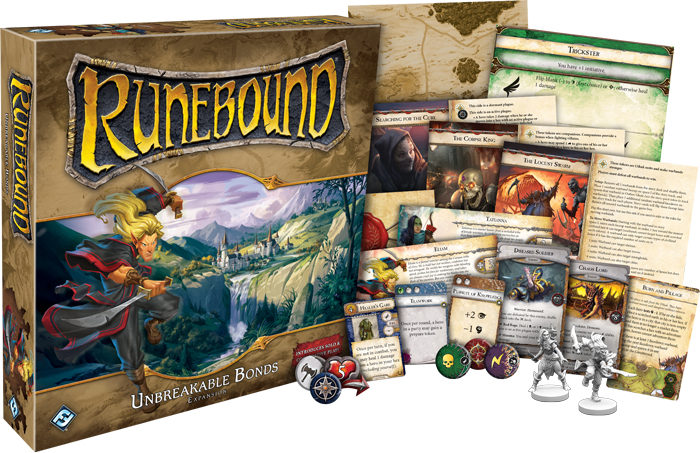 This could well future-proof the game for Unbreakable Bonds to work with whatever is next for Runebound third edition – though of course, we’re still waiting to see any kind of big box expansion come out here. 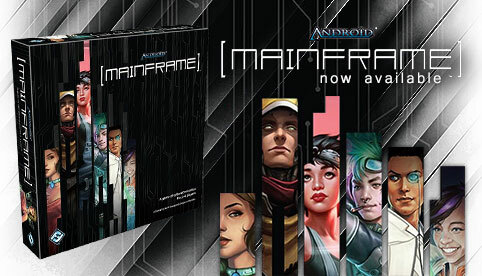 It’s definitely an interesting twist, and has come at a time when I’ve actually been on the cusp of trading off this game as one that I haven’t played since my first foray almost a year ago. I might just keep hold of the game and wait to see what Unbreakable Bonds has to offer me, after all! 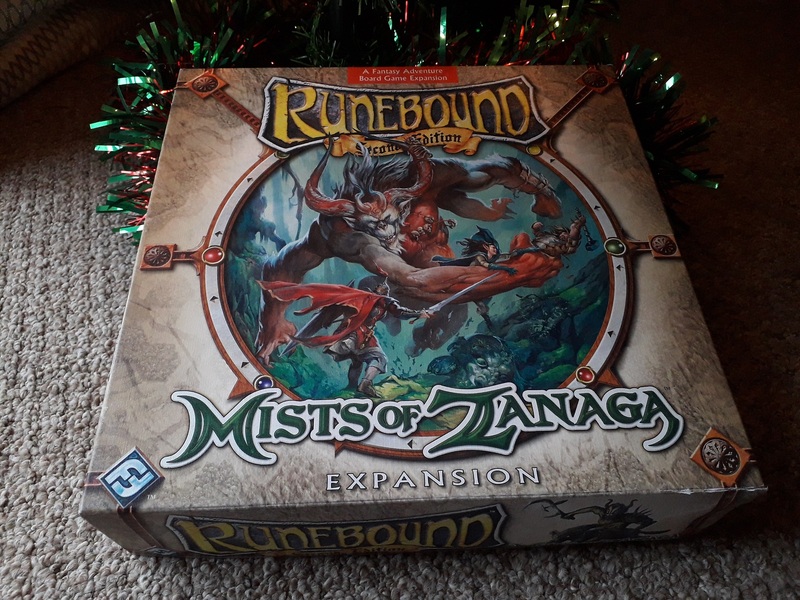 Game day takes inspiration from the recent cold snap we’ve been having, as we take a look at another big-box expansion for the second edition of Runebound! 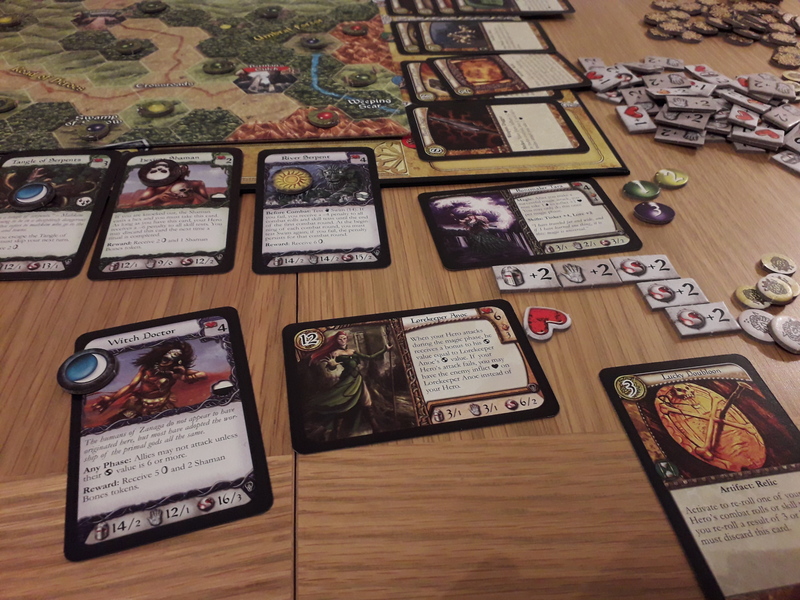 I still haven’t gotten round to trying out the third edition yet, but I really have too much fun with the second edition game anyway, so let’s stick with that for now! 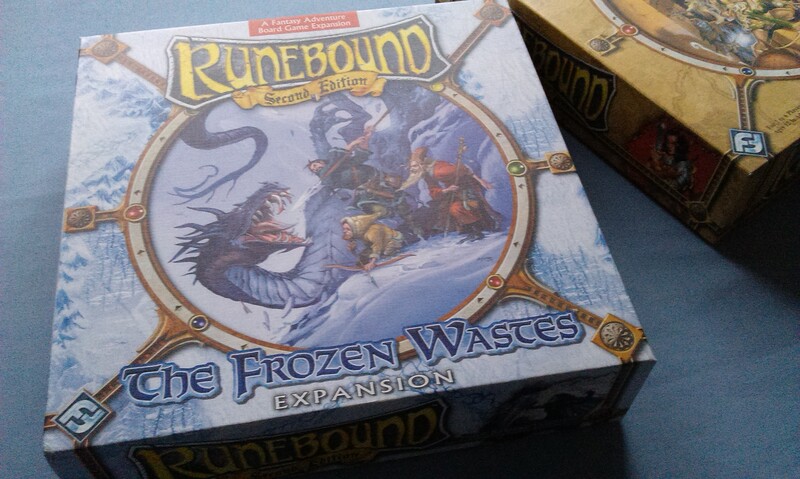 Frozen Wastes was released in 2009 as the fourth big-box expansion for Runebound second edition. 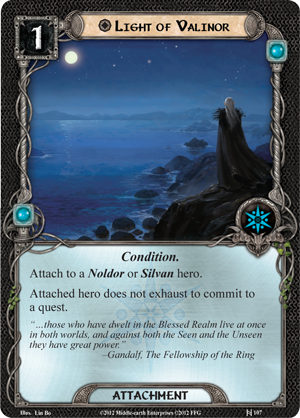 Much like the previous expansion, Sands of Al-kalim, the theme of this expansion is strongly influenced by weather as well as story – in this case, cold (obviously!) There is so much going on with this expansion, so let’s jump in! 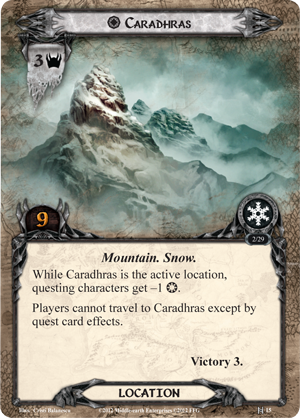 As with all big-box expansions, there’s a new board, which shows the frozen land of Isheim. 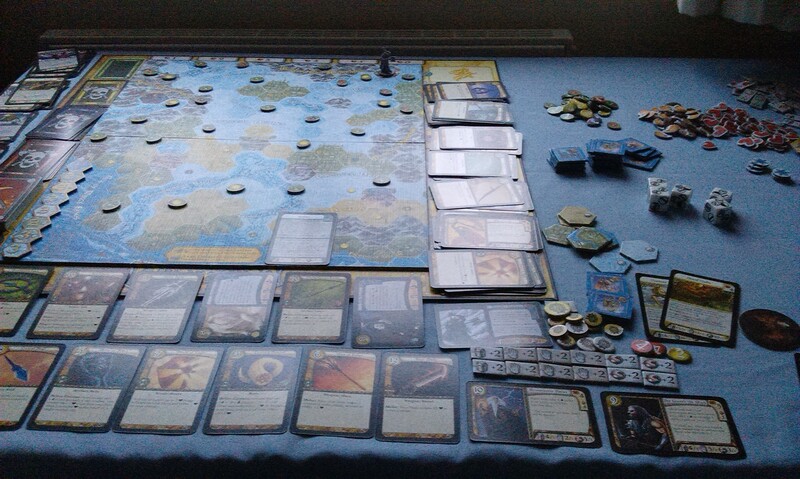 The board itself is actually quite interesting, because of the victory mechanic that I’ll get to shortly. 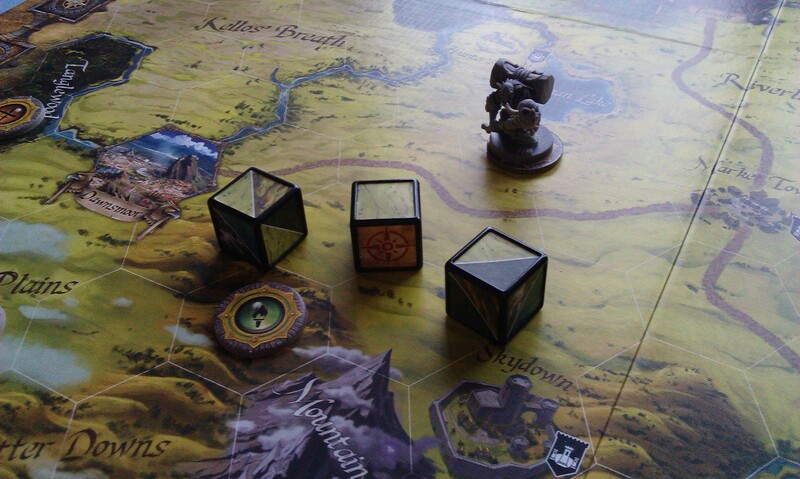 Rather than having towns spread out across the board, they are mainly clumped around the bottom-half, most of which being possible to get to in one roll of the dice. 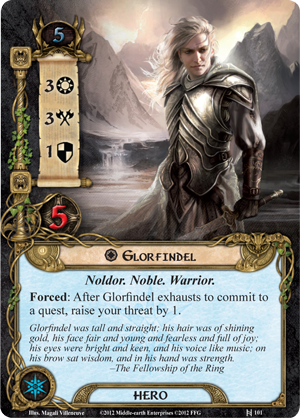 The terrain spaces consist of fjords, snowdrifts, and tundra, and the towns are divided into two types – Weik cities (trading posts) and Onoit villages (healing centres). The story of the game is actually really interesting. 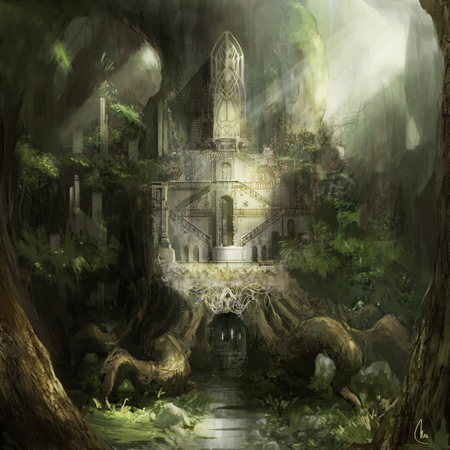 Arshan is searching for his beloved Princess, whose spacecraft crashed somewhere in Isheim with her in a stasis chamber. Arshan released armies of robots across the land to try to find her, but centuries of waiting have driven him mad. It’s up to the heroes to either find the Princess and bring her to Arshan, or else defeat him in single combat, and end his rule of tyranny. 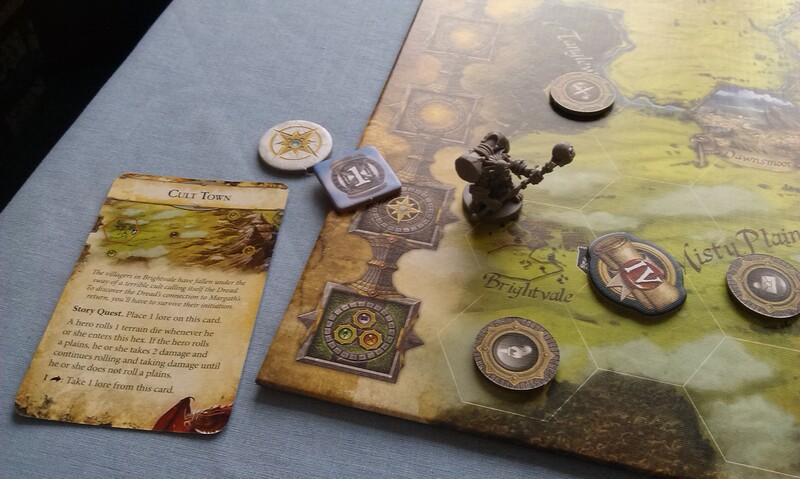 The fantasy theme of the base game of Runebound is still there, but there’s also a kind of steampunk vibe from the mechanical stuff. It’s a nice blend of tropes that, I feel, really works here. 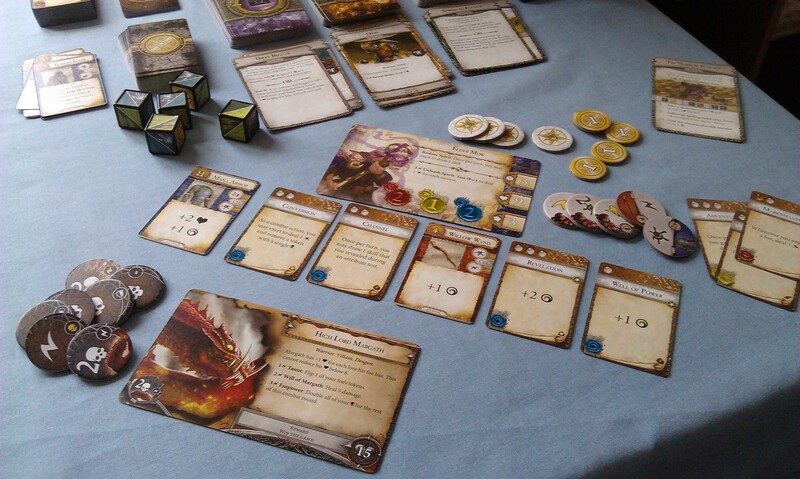 The enemies consist of the usual dragons and whatnot, but also Arshan’s robotic drones. 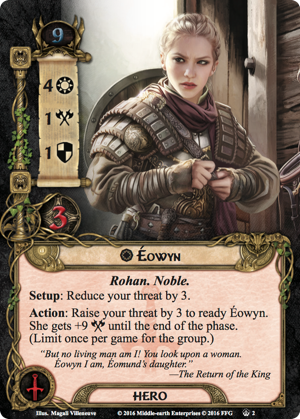 As you go through and defeat these enemies, you have at least two rewards, sometimes three – along with the usual money, you also get the chance to draw either a rumour token or a Princess card. Both show a specific terrain type, and can provide really useful bonuses. 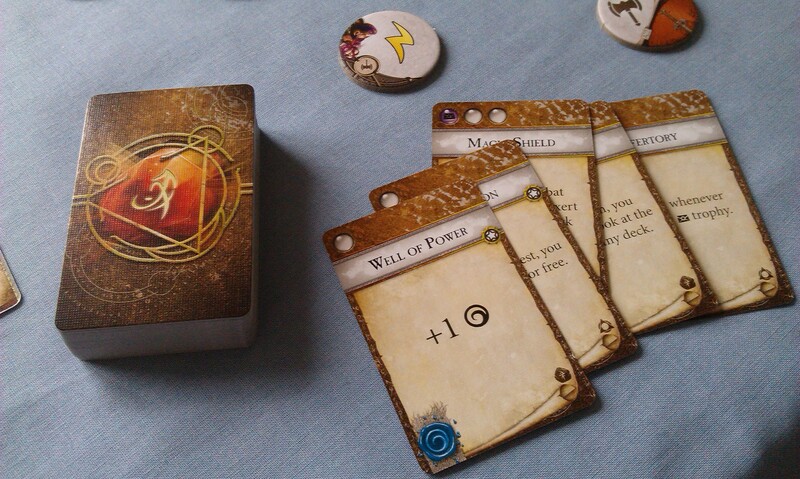 Rumour tokens can be traded in for Legendary items, while Princess cards are used to find the Princess. Legendary items are the same as usual market cards, except they form a separate deck. 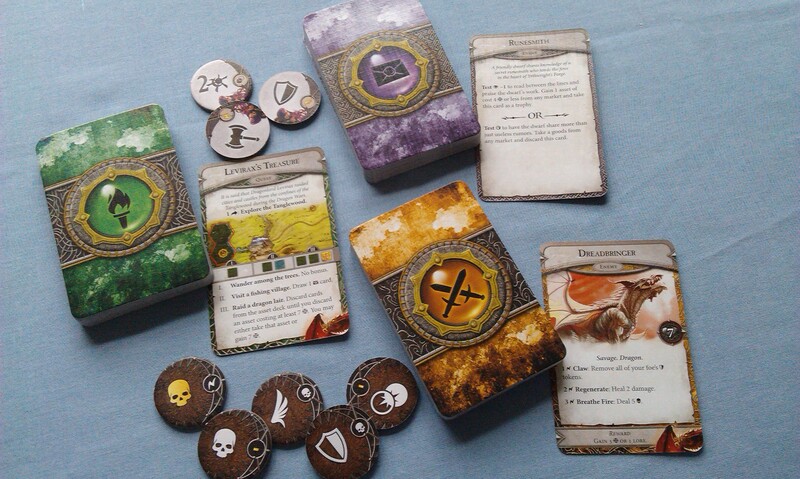 Each card has a coloured icon with a number on it – on your movement step, if you are on a space with the same coloured jewel, and have enough rumour tokens that match both the terrain you are on and the number of surrounding spaces, you can claim the card. They are usually pretty good, though a little specific perhaps. 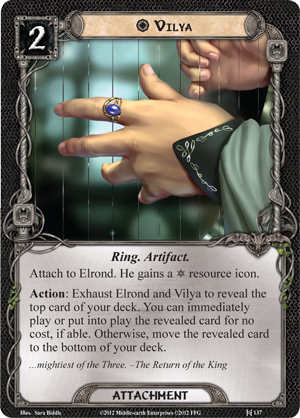 At any rate, you get rumour tokens more often than Princess cards, so you have a pretty good chance to get essentially free stuff. 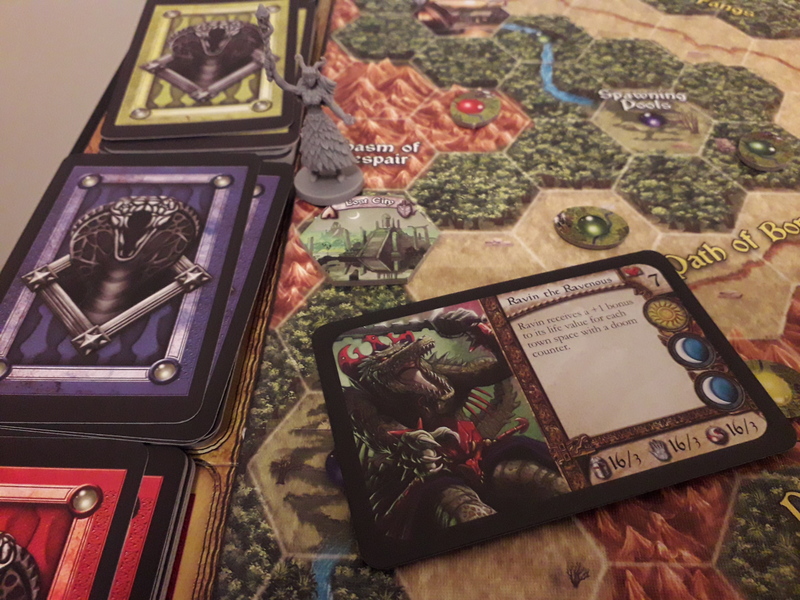 Princess cards work in pretty much the same way – if you have the cards that match all of the surrounding terrain, as well as the space you’re on, you can find the Princess and claim her token. 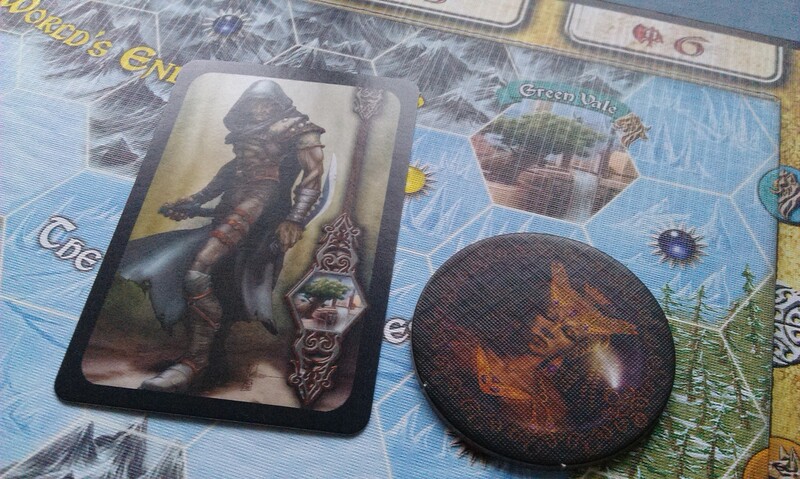 So long as you remain alive as you trek across the frozen wastes to Green Vale, you can win! However, if you get knocked out on the way, the Princess is once again lost in the tundra. 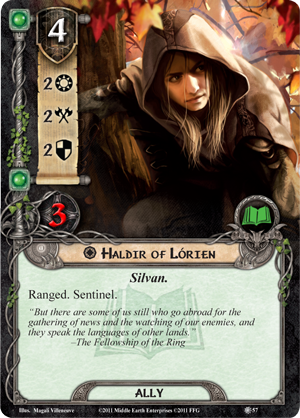 However, this is where the “possibly three” rewards comes in – forage. 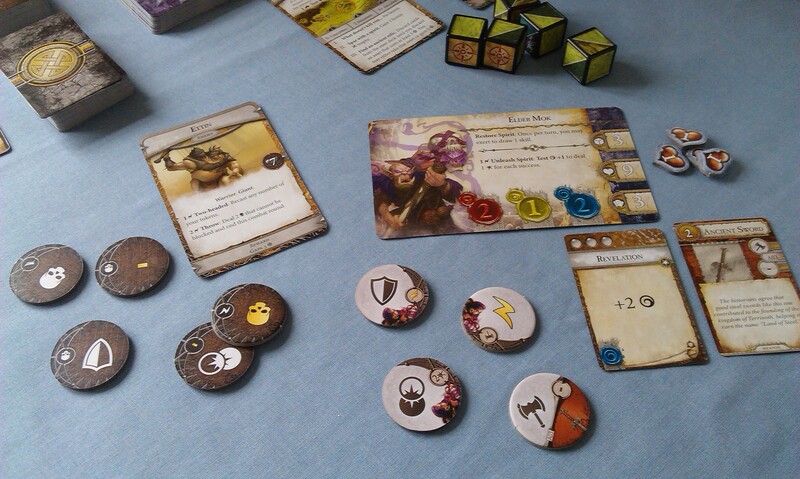 Some of the green and yellow adventure cards also function as forage items – usually animals that could be skinned, or whatever – which allow you to usually avoid the cold or else change dice symbols to something you want, making it potentially easier to get across the wastes. Well, as I said at the beginning, there is a strong theme of weather coming out of this game. 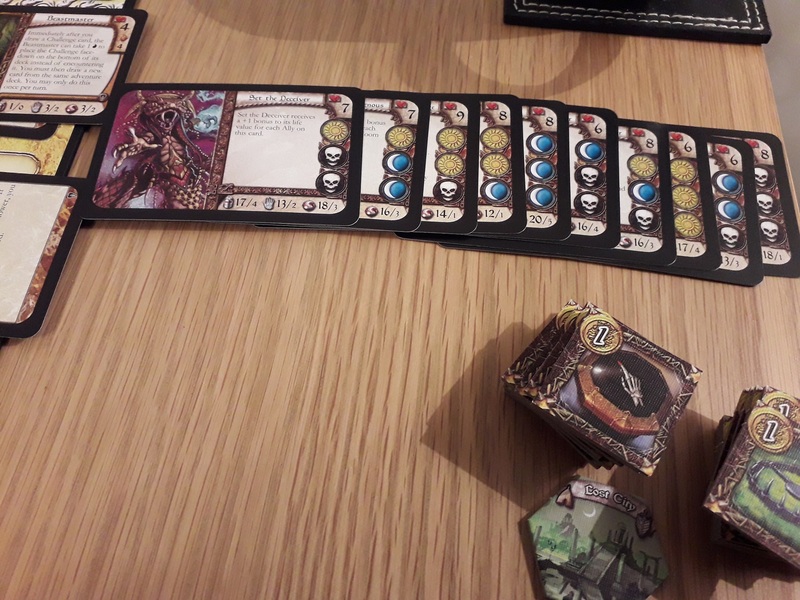 Throughout the game, there are a few event cards sprinkled among the coloured adventure decks that have pervasive effects, replenish adventure jewels, but also change the severity of the weather. 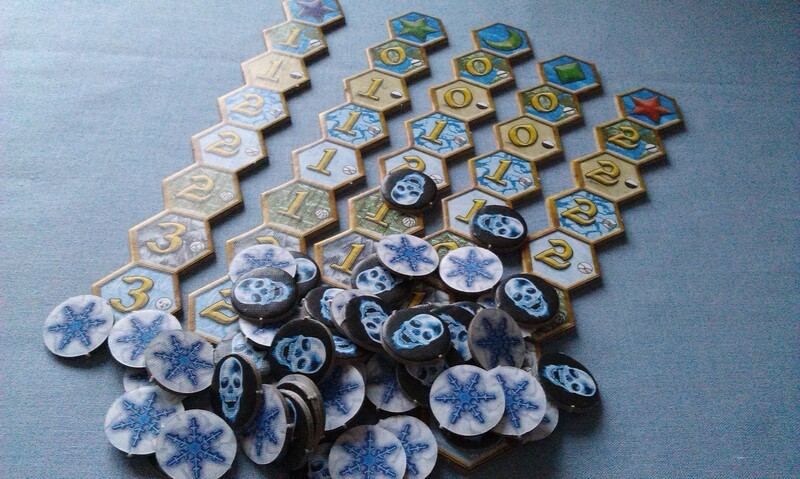 The long strips of cardboard with terrain symbols and numbers on them in the above picture show how much cold you suffer (the snowflake tokens) if you end your move on that terrain. It’s also not just your hero who suffers the cold, but all of your allies. Whenever you enter any town space, you clear your cold counters. However, if you suffer more cold than your life total, you then start succumbing to the White Death. If you take as many White Death tokens as your life total, then you die. 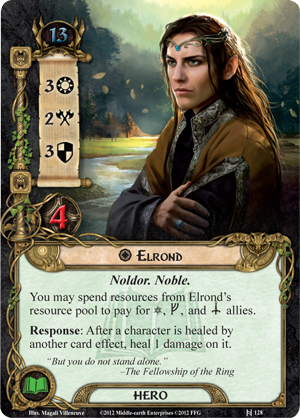 In addition, you can only heal yourself of White Death in the Onoit villages. As the weather gets colder, this becomes super important, as you find yourself returning to the towns to warm up again. 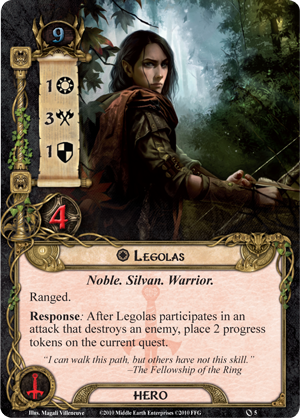 It’s also why you really need to work through those green and yellow cards, rather than rushing straight for the higher colours, to get some kind of forage to ensure you survive the trek. 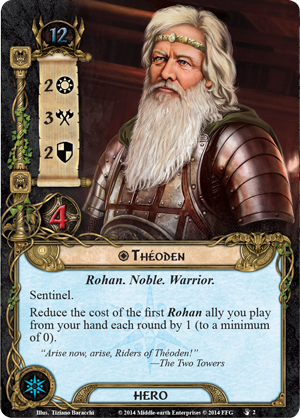 It’s a really cool mechanic, and I feel this is one of the most thematic expansions to any game, ever! 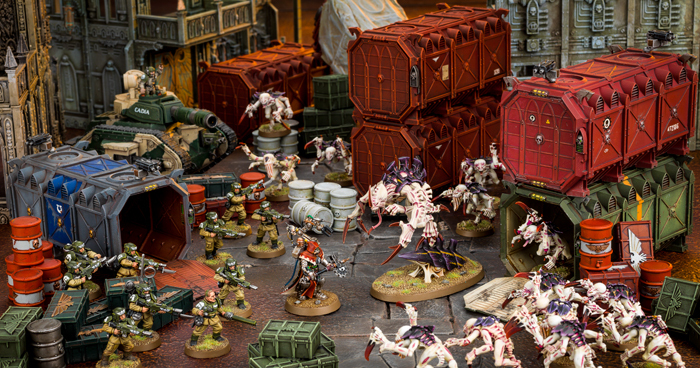 The heroes are all pretty interesting, with some really nice sculpts (though the recent Hero & Monster collections for Descent have started to update some of these, notably Shiver from the right, there). 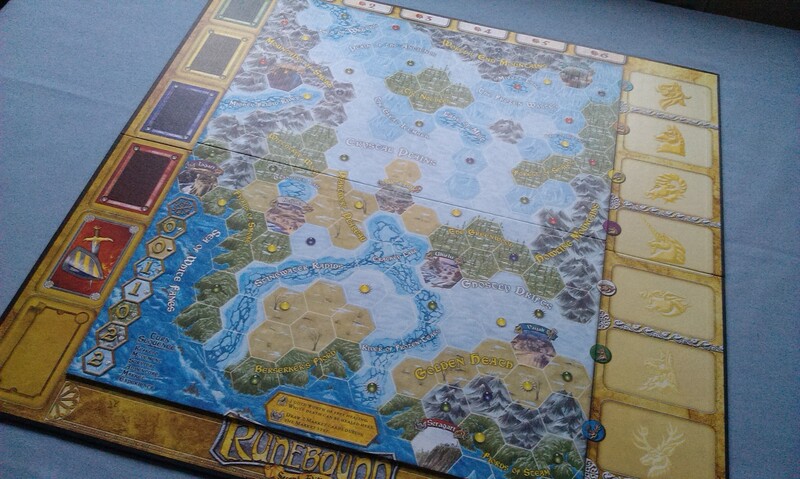 This was the first big-box expansion for Runebound that I played, and I remember being incredibly impressed by the whole implementation of the cold theme, and the novel layout of the map. It’s an expansion that I always return to over the winter, for obvious reasons. The different victory conditions really add some variety, not just to the game itself, but to Runebound as a whole – you’re no longer just trying to level up to defeat a bad guy, you also have the option to play the rescue mission. 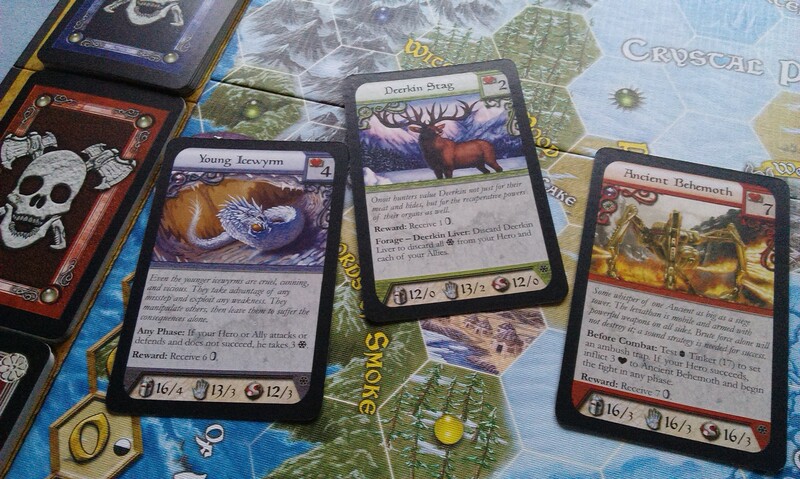 I am a huge sucker for any kind of fantasy setting that involves a snow-covered land, so this game scratches a very special itch for me. 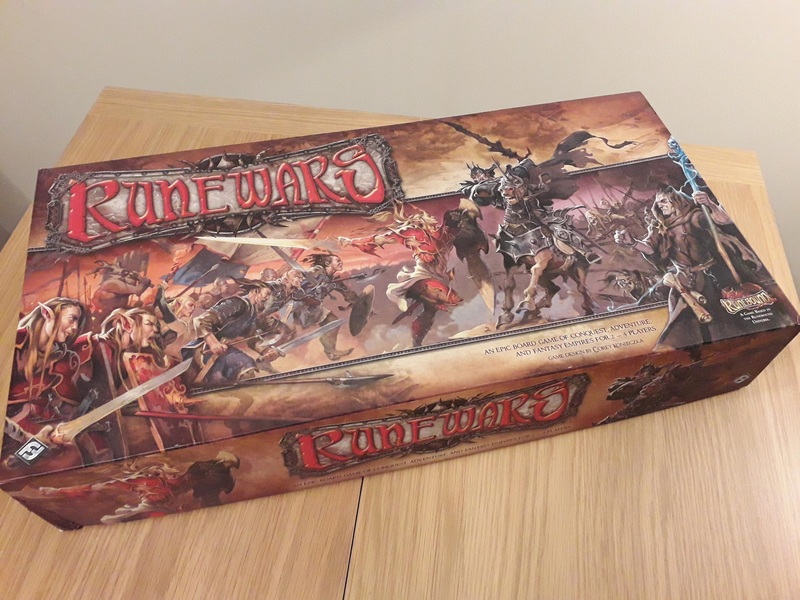 I’m hoping that the new, third edition of Runebound will bring us an expansion with this sort of theme to it, though I feel that will be unlikely as FFG seek to move away into something different and new. 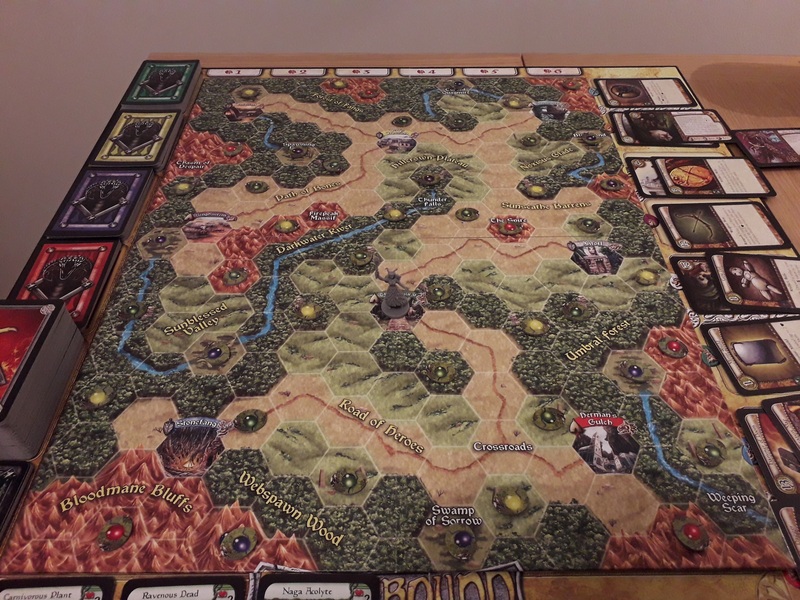 At any rate, it’s a really great expansion to a truly great game, and if you can still find both it and the second edition base game, I can highly recommend it!